Heino Eller (1887-1970) can be considered as one of the founders of Estonian professional music culture. Eller’s legacy is twofold – in his prolific instrumental compositions he forged an elaborate style that successfully combined both modern and national elements, and as a prominent professor of composition during half a century he influenced generations of Estonian composers. 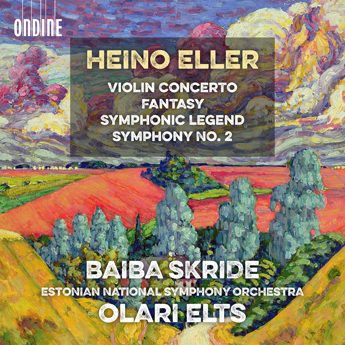 This new recording by the Estonian National Symphony Orchestra conducted by Olari Elts and featuring violinist Baiba Skride includes some of the highlights from the composer’s catalogue of orchestral works and is a fitting tribute to the centenary of Estonia’s independence. Heino Eller’s Violin Concerto in B minor was the first in its genre in Estonian music, and still one of the finest in the Estonian concerto literature. First written in the 1930s the one-movement work was scheduled to be performed in Tallinn on June 1940. For reasons unknown, the work was withdrawn until March 1965 when Neeme Järvi conducted the premiere of the work. During the 1980s this work was performed several times and eventually recorded. Another work for violin and orchestra, Fantasy, was first written in 1916 and orchestrated in 1964. Fantasy is one of the earliest compositions that bears the hallmarks Eller´s individual style, and its sensitive lyricism and charming simplicity give the work an enduring appeal. The Symphonic Legend is Eller’s largest score prior to the First Symphony (1936). It was premiered on June 1923 in Tartu, and Eller revised the score for performance in 1938. A work with a wealth of musical material and masterly orchestration, Symphonic Legend was next performed only in 2014 by Olari Elts with the Estonian NSO, and the current recording is the first. Heino Eller wrote three Symphonies between the 1930s and 1960s. Unlike his other two Symphonies, the 2nd Symphony has only one movement. The work was abandoned soon after the Zhdanov decree was published in February 1948, and only the first movement remains. The severe and at times tragic nature of the music was incompatible with the demands of the official Soviet cultural ideology. Although the work was recorded in 1984, the Symphony was not performed publicly until as recently as September 2012. Violinist Baiba Skride’s natural approach to her music-making has endeared her to some of today’s most important conductors and orchestras worldwide. She is consistently invited for her refreshing interpretations, her sensitivity and delight in the music. The list of prestigious orchestras with whom she has worked include the Berliner Philharmoniker, Gewandhausorchester Leipzig, Münchner Philharmoniker, Royal Concertgebouw Orchestra, Symphonieorchester des Bayerischen Rundfunks, Orchestre de Paris, London Symphony Orchestra, London Philharmonic Orchestra, Helsinki Philharmonic, Gothenburg Symphony. In North America she performs with the New York Philharmonic as well as Boston, Chicago, Baltimore, Houston and Toronto Symphony Orchestras. Further afield she works with NHK Symphony Orchestra, Shanghai Symphony Orchestra and Hong Kong Philharmonic Orchestra. Notable conductors she collaborates with include Marin Alsop, Christoph Eschenbach, Ed Gardner, Susanna Mälkki, Andris Nelsons, Andres Orozco-Estrada, Santtu-Matias Rouvali, Vasily Petrenko, Yannick Nézet-Séguin, Jukka-Pekka Saraste, Tugan Sokhiev, John Storgårds and Simone Young. The Estonian National Symphony Orchestra (ENSO) is the longest continually operating professional orchestra of its kind in the country. The orchestra’s history dates back to 1926 and, like that of many other world orchestras, is connected to the birth of national broadcasting. The orchestra performs with renowned conductors and soloists from around the world, including Estonian musicians of the highest calibre. Its recordings demonstrate a quality recognized by many prestigious music magazines, having won several prizes, including a Grammy Award. In addition, ENSO has regularly given concerts in European and Scandinavian countries, appearing at many prestigious festivals including Köln, New York, Verona, Genoa, Munich, and Stockholm. With a repertoire ranging from the Baroque period to the present, the Estonian National Symphony Orchestra has also given premiere performances of symphonic works by several Estonian composers, including Arvo Pärt, Erkki-Sven Tüür, Eduard Tubin, Eino Tamberg, Jaan Rääts, Lepo Sumera, Tõnu Kõrvits and Helena Tulve. Olari Elts’ international career sees him throughout all continents, performing with such orchestras as the Gewandhausorchester Leipzig, Wiener Symphoniker, Rotterdam Philharmonic, BBC Symphony, City of Birmingham Symphony, Scottish Chamber Orchestra, BBC National Orchestra of Wales, Helsinki Philharmonic Orchestra, the Norwegian, Danish, Finnish and Netherlands Radio Symphony Orchestras, NDR Sinfonieorchester Hamburg, SWR Radio- Sinfonieorchester Stuttgart, Munich Chamber Orchestra, Orchestre National de France, Orchestre de Lyon, Orchestre National du Capitol de Toulouse, Orquesta Sinfónica do Porto Casa da Música, the Seattle and Cincinnati Symphonies and the National Arts Centre Orchestra in Ottawa. In the Far East, he works with the Yomiuri Nippon Symphony Orchestra and Malaysian Philharmonic. In Australia and New Zealand, he conducts the symphony orchestras in Melbourne, Perth, Hobart and Adelaide as well as the New Zealand Symphony Orchestra. Soloists with whom he collaborates include Jean-Efflam Bavouzet, Gautier and Renaud Capuçon, Brett Dean, Isabelle Faust, Alban Gerhardt, Martin Grubinger, Martin Helmchen, Stephen Hough, Felix Kleiser, Kari Kriikku, Sally Matthews, Karita Mattila, Baiba Skride and Antoine Tamastit. Olari Elts is founder of his contemporary music ensemble, NYYD Ensemble. Through a broad range of repertoire he combines a strong commitment to vocal and choral as well as contemporary music, with close associations to his fellow Estonians, Arvo Pärt and Erkki-Sven Tüür.